Put 5-6 passion fruit seeds in the glass and muddle with home-made tea syrup. Halve the fresh passion fruit, then with the fresh fruit inside skewer through with 2 chopsticks. In a separate pot, infuse the Dilmah Vanilla Ceylon Tea for 3 minutes. 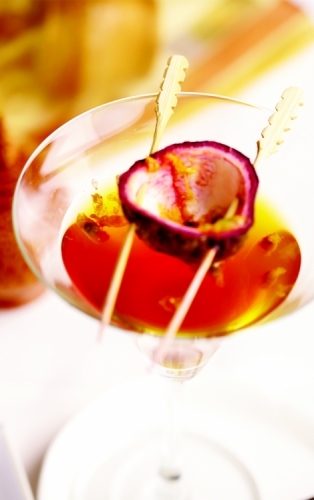 To serve, place the fresh passion fruit half over the martini glass with the help of the chopsticks. Either end of the chopsticks will sit on the rim on the glass. Then add the syrup to it. Pour hot tea in to the passion fruit, similar to a fountain.